Some play Magic to win, and others play to have fun. Most players move up and down the spike scale depending on context—the casual nature of certain tournaments provides a perfect backdrop to test wacky ideas. With this principle in mind, I good-naturedly brought a neutered Eldrazi deck to FNM last week that splashed blue and green for playsets of Tarmogoyf, Ancient Stirrings, and Ancestral Vision. I also threw a Gut Shot into the main because mise. Despite losing horribly, the deck taught me a few interesting lessons. First, in many games, Tarmogoyf is practically an Eldrazi. In others he’s even better. Second, Eldrazi Temple is still busted. To those convinced that Eldrazi is “dead” post-ban, just remember one thing: what dies grows the Tarmogoyf. TarmoDrazi is best understood split into parts. It combines the Eldrazi core with green and red splashes. Eldrazi Mimic, Endless One, Thought-Knot Seer, and Reality Smasher formed the 16-card creature core present in nearly all Eldrazi decks from last season. GR variants often exchanged Mimic for the Kozilek’s Return-proof Matter Reshaper, but the other creatures seemed sacred to the archetype. Without Eye of Ugin around, Eldrazi Mimic and Endless One plummet in value. Gone are the blistering starts of double or triple Mimic into a 4/4 or 5/5, and Endless One‘s miraculous curve-fixing on the road to Reality Smasher mana. With those two cards relegated to the flex spot bin, we’ve got plenty of space to work with as we craft a new Eldrazi deck. Matter Reshaper: Reshaper merits new attention with Eye gone, as it at least trades with every one- and two-mana threat in the format barring Tarmogoyf and triggers an improved Coiling Oracle effect on death. Spellskite: Versatile hate cards can also make their way back into the mainboard. We saw Skite and Ratchet Bomb in the colorless lists from Pro Tour Oath of the Gatewatch, but these interactive pieces stayed in the sideboard after the tournament, as Eldrazi players began gravitating towards hyper-linear UW builds. Chalice of the Void: Another possible option to fill in for expired core components is Chalice of the Void, but I’ve omitted the artifact from this list. GR really aren’t the colors for Chalice, since some of the best reasons to go into them (e.g. Ancient Stirrings and Lightning Bolt) cost one mana. Chalice is an undoubtedly powerful Modern card, and I’d be surprised if we don’t see an Eldrazi deck surface that abuses it. But TarmoDrazi isn’t the place. I mentioned a lull in our curve-fixing options left by Endless One. Green cards do a fine job plugging that hole. Tarmogoyf: I’m beginning to think Tarmogoyf was an Eldrazi all along. The creature has always defined Modern, serving as the format yardstick for raw efficiency and bulk: a cheap, huge, hard-to-remove threat that excelled at offense and defense. Sound familiar? The reason Eldrazi.dec was so good pre-ban is that it got to play 12 Tarmogoyfs, most of which had icing-on-the-cake abilities. Without Eye of Ugin, Endless One is no longer a “Tarmogoyf,” as we can’t cast him off Eye plus Urborg for four. But we can still play 12 Tarmogoyfs by dipping into green for the real thing. Goyf even inhabits the same place on the curve, coming down on turn two in lieu of a Temple. And since we’re playing type-heavy cards like Tarfire and Spellskite to turn on Traverse the Ulvenwald, Goyf frequently outgrows his Eldrazi mentors by the midgame. As with OG Eldrazi, these curves boast interaction starting from turn one and make proactive plays nearly as good as those of Modern’s linear decks. Grow turn-two Tarmogoyf past Bolt with a Wooded Foothills. Find Eldrazi Temple for turn two Reshaper/turn three TKS/turn four Smasher. Find an Eldrazi to compliment our in-hand Temple. Find Cavern of Souls against Cockatrice’s sea of Ancestral Vision decks. It was difficult for me to wrap my head around the power of this green cantrip until I tried it. Stirrings remains relevant throughout a game and thus far has never whiffed. Traverse the Ulvenwald: When I decided to splash red over blue, it occurred to me that delirium wouldn’t be that hard to turn on. A few Tarfires later and my dream of mashing every Tarmogoyf deck together became a reality. I’ve also had opponents accidentally turn delirium on as early as turn two, when they Terminate my Spellskite or something. That means I’m free to Traverse for a Temple and play a huge Eldrazi on turn three while enjoying a mana advantage for the rest of the game. World Breaker: Breaker is less of a curve-topper and more of a bullet in this list. We can search it with Traverse to remove a problematic artifact or enchantment, and against attrition decks missing Path to Exile, it’s an impossible-to-remove threat. Breaker might prove unnecessary in the mainboard with more testing, since it’s all but dead against Modern’s more aggressive decks. But so far, I’ve liked having access to a single copy before boarding into Reclamation Sage. TarmoDrazi’s red spells allow us to cheaply interact with opponents while enabling our graveyard-reliant cards as efficiently as possible. Lightning Bolt: Goyf loves his Bolts, and so do I. As Sheridan’s recent metagame snapshot reveals, Lightning Bolt is still king among interactive spells in an Eyeless Modern. That said, I’ve only included two here, shaving its numbers for the more on-plan Tarfire. Tarfire: My love for this card knows no bounds. I found early in testing that the creatures I wanted to kill rarely had three whole points of toughness, and that I needed to turn on Traverse the Ulvenwald faster to get the most out of it. I initially tried a split between Tarfire and Seal of Fire to maximize my Goyfs, but Tarfire’s double typing has so much synergy with Traverse that I ended up cutting Seal entirely. Tarfire stops Delvers and Cliques from flying over us to victory, puts Infect and Burn on hold long enough for Thought-Knot to disrupt them beyond repair, and greatly improves our Goyf clock against linear combo decks. Dismember: Okay, so this card isn’t red. But it falls in line with both Bolt and Tarfire when it comes to function. I started with four Dismembers, then cut back to three and two as I added other interactive options. Dismember kills things deader than Bolt, but the four-life cost becomes very steep after we’ve activated one. Still, the card is too unconditional to omit. The Eye of Ugin ban hit Eldrazi decks square in the manabase, so I think it’s important to talk explicitly about the lands in this deck. With eight green cantrips, and the set of Serum Powder to help us ramp, we can afford to run a miserly 22. 4 Wooded Foothills: Omitted from last season’s GR Eldrazi decks, but we need Foothills for its graveyard interactions. Searches for colors while supporting Tarmogoyf and Traverse the Ulvenwald. 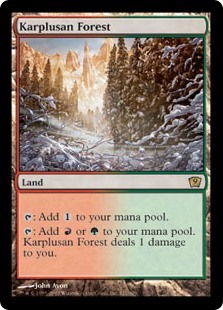 4 Karplusan Forest: Essentially tri-lands in Eldrazi decks, painlands compliment the strategy perfectly. I originally tested Grove of the Burnwillows in this spot, but didn’t like having to attack with Reality Smasher another time to finish the game. The damage from Karplusan has been less relevant for me than the life gain from Grove. Especially in aggressive decks containing reach, like ours, it’s important not to give opponents life points. 2 Cavern of Souls: When I tried Traverse in the deck, I cut back to a single Cavern, knowing I could just search it up as needed. The problem with this thinking is that we never want to search for Cavern—we want to draw it naturally. We’d much rather spend those Traverses on uncounterable Reality Smashers. Cavern gives us huge game against Mana Leak decks, which struggle immensely to deal with Smasher outside of the stack. 1 Sea Gate Wreckage: One copy of Wreckage is testing the best. When things stall out, having access to a source of recurring card advantage is gamebreaking. I especially like Sea Gate with Eldrazi Temple, since we can tap more than half of our lands and still be able to play the fatty we draw. 1 Ghost Quarter: Quarter isn’t here as a bullet, although I guess at one copy that’s what it’s become. I started with a set of Quarters before picking up Traverse, and have cut back to a single copy after shaving numbers for lands I needed more. I still like the one copy and would play more if space allowed. 1 Wastes: A colorless source we can search with Traverse. Especially relevant when we board in Magus of the Moon, since we can cast him with just a Forest and take solace in the fact that our deck contains nine colorless sources to draw into. 4 Serum Powder: Powder taps for mana, sure, but it compliments the manabase in another way by finding us mana-efficient hands. Setting up a slow hand with Ancient Stirrings and Traverse the Ulvenwald can cost us both mana and time. The free mulligans from Serum Powder are even more relevant in a format that only lets us run four Sol lands, since finding one is paramount to explosive openings. Tarmogoyf can only pull so much weight in the other direction when we don’t have a Temple handy. Powder also improves our post-board games. It helps aggressively mulligan into hosers like Kozilek’s Return or Feed the Clan, and makes sure we have hands quick enough to deal with Modern’s linear decks. Against slower interactive decks, we can safely board out Powder for “real” cards, since we’re guaranteed a longer game that gives us time to make our land drops. Early-stage testing with TarmoDrazi shows that the deck has real promise, but I won’t take all the credit. I can attribute much of my success to the crazy power of Lightning Bolt, Tarmogoyf, and Thought-Knot Seer. I’m also unsure whether TarmoDrazi will end up being the best Eldrazi deck—and mark my words, there will be a best Eldrazi deck. Modern hasn’t seen the last of Reality Smasher. Eldrazitron variants seem to have lost the least oomph from the Eye banning and are likely here to stay. There could also be hope for a black version combining Liliana of the Veil, Chalice of the Void, and Sea Gate Wreckage. Regardless what the future holds for Eldrazi, this build does everything I could ask of a Modern deck, and I’ll continue testing it as the format develops. Sorry, Delver of Secrets. At least for now, my heart lies with another breed of efficient beaters. Before PT Oath, you ran serum powder in Eldrazi Stompy. And you kept running it. Yet I never saw anyone else run it, from B to BW to Colorless to UR to GR and finally to UW which was the “final form” of the deck that dominated the entire format. A gazillion iterations on this deck, surely some of which were made by people who knew of Serum Powder and perhaps read your articles, but I never saw any prevalence of successful builds running this card. And now you have tarmodrazi and you are still running Serum Powder. Why? Where are the results? I am skeptical that this card is correct to play when no one else ever bothers with it. It looks to me like the same kind of thing that players ask about why every deck that can run cards like manamophose or G Probe don’t do so. You knew of this card because of Dragon Stompy in legacy getting Sol Lands. But the sol lands in legacy not only accelerate your game plan but also accelerate into the serum powder which eldrazi lands never do in hands where u draw the card and don’t need to mulligan. This makes SP better when you draw them in Dragons than in Eldrazi. Another deck that runs SP is dredge to get Bazaar. But Bazaar is a game winning engine without which the deck almost cannot function, it is much more integral and therefore much better to run SP. In contrast, SP in tarmodrazi, best case scenario, is that you get 1 turn of acceleration extra. But the probability here is low and the benefit is not back-breakingly powerful even though the costs of running SP are still high. You should do an article for your eldrazi deck with probability data with and without serum powder. Not only the extra chance of getting Temple, but with win percentages. I bet it is lower because the marginal probability that a SP mulligan leads to a win in comparison to a regular mulligan is lower than the odds of losing games on the margin from bricking on a SP late game. I agree with Mr. Philip Linden. This reminds me of myself, in that I will latch on to one card and try everything to make it work. However, when it doesn’t, I don’t try constantly to make it work, even if it is not the best card for the strategy. Other than the Serum Powder, the deck looks great. Maybe with the space from the Serum Powder, you can add more bolts, and maybe even Reality Hemorage! First of all, thanks for the well-reasoned and thoughtful comment. I actually have tried this deck without Serum Powder (first running a combination of Endbringer and Dismember, and eventually settling on two more Bolts and a pair of Ratchet Bombs) and went back to the Powders mainly because we lack threat density. Without Eye of Ugin, plenty of Eldrazi we could previously run like Mimic and Endless One become sub-par. There simply aren’t any threats we can run in addition to Reshaper, TKS, Smasher, and Goyf that are close to as efficient as those four. Other threats end up clogging us and stumbling out a turn too late to have as much of an impact. Serum Powder helps us rapidly get to hands that really do something without forcing us into those bad threats. In this deck, it’s also less painful to draw Powder than in other Eldrazi builds; it helps accelerate into World Breaker (relevant since we can find it) or expensive bombs post-board (like Kozilek, who I’ve found integral to beating Vision decks that lead by suspending two of them), or achieve hellbent for Sea Gate. It’s also a colorless source under Blood Moon, which I really like since I play Magus myself in the side. All that reasoning aside, I agree that it would be interesting to see (and make) a probability article on Temple and Powder, and will look into it. But if you’re thinking about trying the deck and don’t like Serum Powder, cut it for something else. No use refusing a good meal because you find a pebble in it; just remove the pebble and enjoy! @Nicholas D: I think Bolt is way better in this deck, or Kozilek’s Return mainboard if we wanted a searchable removal spell. While others have talked about Serum Powder, I want to ask about Tarfire. Is the slightly easier delirium and the extra +1/+1 on goyf really worth running three copies of shock? And I’m not sure goyf is where this deck wants to be anyway. As ridiculous as it sounds, goyf is too “fair”. I’d rather use the 1G on Sylvan Scrying to drop a T3 Eldrazi temple and TKS followed by a T4 Reality Smasher. But goyf will just sit there. He won’t clique the opponent. He won’t 2 for 1 them if they want to kill him. He doesn’t trample. He won’t replace himself. In fact, on turn 2 and 3 he’s just a 3/4 beatstick. I think Tarfire is definitely worth it. I originally ran four Bolts and ended up cutting one, then two to make space for extra Tarfires. Land + Traverse/Stirrings + Tarfire = delirium. Land + creature + Tarfire = delirium. Skite + Tarfire = delirium. Turning on early delirium lets us Traverse into Temples and accelerate our game. I agree that Kozilek’s Return is a beating for some decks (esp. CoCo/Infect/Affinity), and settled on a pair in the sideboard after trying them main. You should try this deck out if you don’t think Goyf is a good fit, he’s been tremendous for me in putting on pressure early before I have enough lands (either three or four) for TKS). It’s pretty important to make a second turn play against many Modern decks, and Goyf outpaces even Reality Smasher by the midgame. One thing though… land + tar fire + traverse does not turn on delerium. 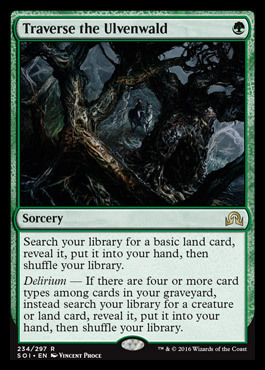 Delerium only checks your grave so killing something with tar fire won’t enable delerium. I may not have been clear – I mean if land, Tarfire, and Traverse (or Stirrings) are all in your graveyard, the copy of Traverse on the stack will have delirium turned on. I agree completely with your assessment of goyf in the eldrazi builds but i still think the optimal splash color is black over green. i was testing with this deck before the pro tour/ twin ban and was having some success. Your turn one plays being seize or inquisition help grow your goyf easier, pave the way for later threats or just buy you time on slower hands by timewalking their next turn. You have more versatility in your removal package and your control match ups become significantly better. But my question is do you think oath of nissa (a weaker stirrings) could be a better fit than traverse? i know late game traverse has a lot of upside by tutoring threats i just feel like at least in your build you have some hoops to jump through to get delirium online. Hm… I definitely think you’re on to something here. The Eldrazi creatures have lost none of their potency, you just need to restructure the deck shell around them. I think that Kozilek’s Return should definitely be in the mainboard given the current state of the meta, and I would say that given that context 1 World Breaker is probably not enough. Do you think this deck could make use of manlands like Mutavault or Blinkmoth Nexus? I think the manabase is too tight as it is since we have to squeeze fetches in there for Goyf. If I had more land spots I would play additional Quarters. I haven’t seen a highly linear metagame myself, and we go bigger than BGx without using multiple Breakers. But if the metagame takes a dive in one direction or the other, mainboard Returns or additional Breakers certainly have a place here. We don’t have enough data right now to say for sure what it wants though.